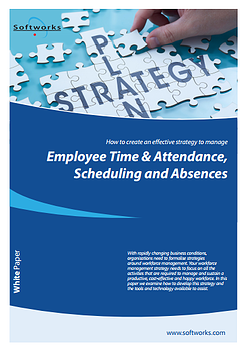 In this free to download white paper we examine how to develop this strategy. Formalising strategies around workforce management. Aligning employee activities and costs with business goals and objectives. Gaining greater visibility, insight and access to workforce data by automating employee time and attendance, scheduling and absence management. Ensuring compliance with the latest legislation and regulations. Implementing proactive absence management procedures. Formalising flexible, remote and mobile working policies.